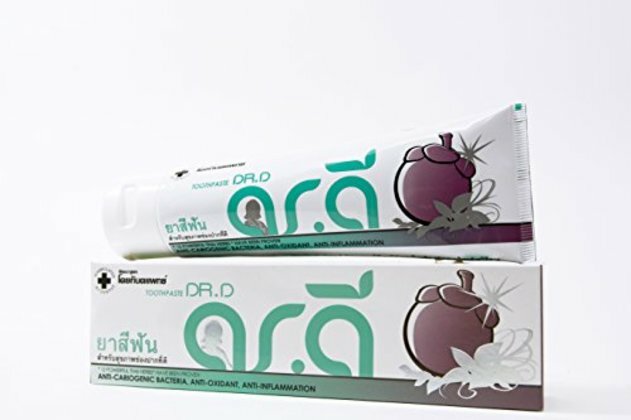 BEST DIABETIC TOOTHPASTE - Diabetic patients require special oral care as the amount of high sugar content in your saliva can lead to growth of harmful bacteria. This can lead to plaque formation, tooth decay, chronic inflammation or infection in the mouth. Dr. D Tooth paste is a herbal toothpaste specially formulated for oral care of Diabetic patients and can help keep a check on bad oral diseases which can be difficult to manage otherwise. BETTER ORAL HEALTH - Unlike other toothpastes which contain a harsh chemical called Sodium Lauryl Sulfate (SLS), added to create foaming, Dr. D toothpaste is free of SLS and any other harmful chemicals which can have adverse impact on oral health. SLS has been found to damage tissues in the mouth and in turn result in mouth ulcers, canker sores and dryness, which can lead to a number of oral complications. SUPERIOR QUALITY INGREDIENTS - Our formula has an incredible blend of 12 Thai herbs which have a synergistic effect and help maintain highest level of oral health. The amazing research based blend imparts our formula potent anti-cariogenic, anti-inflammatory and oxidation inhibitive properties - making it one of the best diabetic oral care solution. More importantly, our toothpaste contains no saccharine, artificial color and flavour, or parabene and benzoate. INTERNATIONALLY RECOGNISED - Our research and diabetic tooth paste formula has been recognised on many international platforms. We have received a special award from 'Association of Polish Inventors and Rationalisers' and gold medal from ITEX (International Invention, Innovation and Technology Exhibition) for the invention of this toothpaste. We are also GMP certified as per the international requirements - making our toothpaste the best choice for diabetic oral care. 100% RISK-FREE SATISFACTION GUARANTEE - We also offer you 100% risk-free satisfaction guarantee to let you buy with confidence; no questions asked. However, we are quite sure that you will get immensely benefited by this incredible toothpaste and will love yourselves for the decision of buying it. The toothpaste comes in a 3.5 oz pack.